Tools of the Trail Volunteer / Land Steward’s trade. 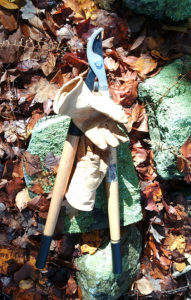 Join Lyme Land Trust on Sunday, Oct. 21, (rain date Oct. 28) from 1:30 to 3:30 p.m. for a trail maintenance boot camp at Hartman Park in Lyme. Do you love Lyme’s preserves and want to help maintain them? Come learn how you can help by becoming a trail volunteer or property steward. At the Boot Camp, you will learn basic trail maintenance and property stewardship tips, including what to bring with you on the trail, how to identify the most common invasive plant species, and what requires reporting back to the town or Land Trust. You will also be introduced to the free smart phone app TrackKit. Using GPS, the app tracks your path and allows you to mark location on trails to best report a problem or downed tree. Strategies for preventing tick bites will be discussed as well. Preserve stewards have a little more responsibility than trail volunteers: they adopt a preserve as their own and conduct regular visits to check boundaries, communicate with landowners, and submit online monitoring reports. The event is presented by the Lyme Land Trust and the Town of Lyme. Bring along water, heavy-duty gloves, and light-weight tools: clippers, pruners, and/or loppers. Snacks will be provided. Meet at the Main Parking Lot of Hartman Park on Gungy Rd., about one mile north of the four-way stop signs at the intersection with Beaver Brook Rd. and Grassy Hill Rd.